For Social Studies in Early Childhood/Primary Education and Curriculum in Early Childhood/Primary Education courses. Highly regarded in the marketplace, this sound resource provides a multitude of practical ideas, suggestions, and activities that prospective early childhood teachers can use to interest young children in social studies and integrate social studies with other content areas: science; the arts; literacy, language development, writing, and literature; and mathematics. Written with an emphasis on child development that resounds throughout the text, readers will discover chapters on thinking, social skills, and cultural values as they learn how to incorporate such development and learning through the social studies. Chapters on planning, assessment, and resources for learning will support the beginning teacher in implementing a developmentally appropriate social studies curriculum. Additionally, the authors have included separate chapters on play, diversity, and including students with special needs. This edition covers all 10 of the recently revised NCSS Thematic Strands, and the current NAEYC standards for quality, curriculum, and professional preparation are thoroughly incorporated. Culture and diversity, a new feature on children’s literature, and a greater emphasis on integrating technology are also highlights of this edition. Be guided by a focus on the general milestones of childhood growth, development, and learning. The strong emphasis on child development, stressed throughout the text, ties child development theory to effective planning, emphasizes the need for “active learning” and will help teachers help young students successfully learn in the early classroom environment. Become familiar with the best resources available for teachers. Throughout the text, the authors encourage making the most of the resources offered to teachers from school, family, community, children’s literature, and technology. 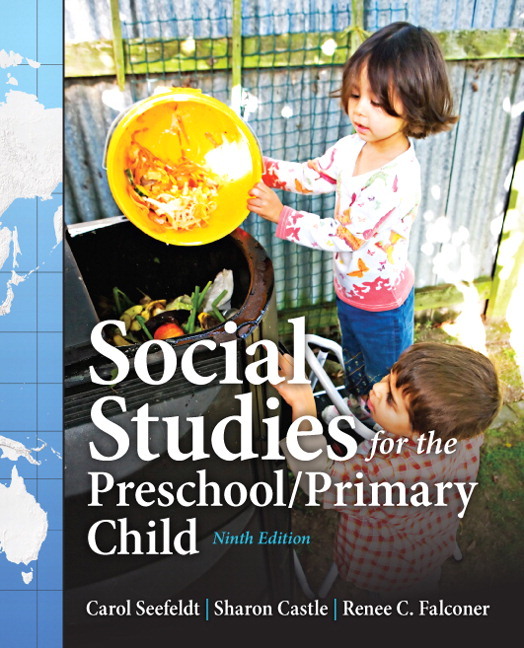 Gain knowledge from the most current information available with an expanded treatment of key topics in the social studies curriculum–including the thematic project approach and multicultural education–the text promises future teachers will be given the most pertinent information relevant to today’s educational environment and what they need to know in order to succeed in their first classrooms. Develop a greater respect for culture and diversity with a plethora of resources and rationale for future teachers. With guidelines for full inclusion of all learners–regardless of special needs, language, or individual differences–the text features a separate chapter on culture and diversity, including a full complement of curriculum materials, methods, and activity ideas for teaching young children to value themselves and others. Remain focused on key chapter content with a litany of review guides. Opening questions, a concluding summary, discussion questions, extend your knowledge activities, and references in every chapter, these handy tools will quickly guide readers’ attention to the most important core content, and act as a useful means for processing the information, and a reliable gauge to test their level of understanding of chapter material. 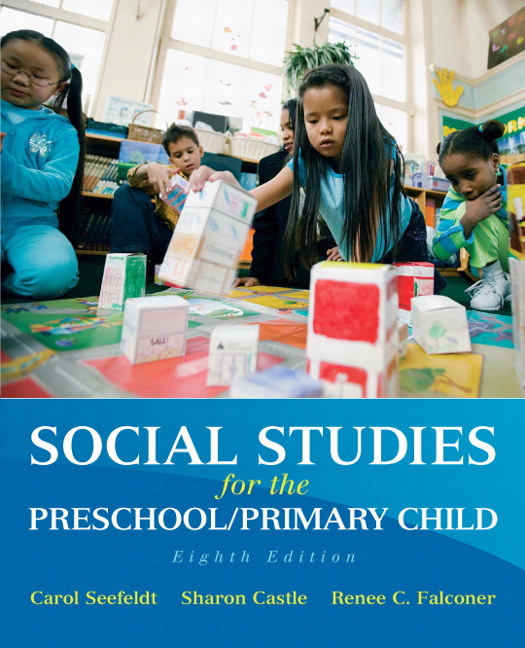 The Tenth Edition has been improved upon from previous ones by including the most current updates in standards, technology, resources, learning, evidence-based practices, and research related to teaching social studies to children in the preschool and primary grades. Become knowledgeable about the NCSS Standards. This edition features the most current standards throughout the text. A figure listing each of the strands appears in the relevant chapters for predictable and easy access. Learn about high-quality children’s literature beneficial to teaching social studies. The new Children’s Literature boxed feature is located in the chapters on culture, history, geography, economics, government, and global connections. Delve deeper into the key content and process the course material in class with new Discussion Questions featured at the end of each chapter. Benefit from the most up-to-date research and references. Throughout this edition, readers will find the most current evidence-based practices related to teaching social studies to young students. Be inspired by new ways to integrate technology into the social studies curriculum with expanded technology ideas throughout the text. Understand how to assess social studies learning in the classroom with a newly expanded Chapter 2 on planning and assessment. At her death in 2005, Carol Seefeldt, Ph.D., was Professor Emeritus of human development at the Institute for Child Study, University of Maryland, College Park. She received the Distinguished Scholar-Researcher award from the university and published 25 books and over 100 scholarly and research articles for teachers and parents. Her books include Social Studies for the Preschool/Primary Child, Active Experiences for Active Children (Science, Social Studies, and Mathematics), and Current Issues in Early Childhood Education. She also wrote Playing to Learn and Creating Rooms of Wonder. She coauthored Early Childhood: Where Learning Begins-Geography for the U.S. Department of Education. During her 40 years in the field, Dr. Seefeldt taught at every level from nursery school for 2-year-olds through third grade. She frequently conducted teacher-training programs in the United States, Japan, and Ukraine. Carol's research revolved around program development and evaluation. Her contributions to the field were extraordinary and her influence carries on. Sharon Castle is a retired Associate Professor of Education at George Mason University. She taught early childhood and elementary socials studies, fine arts, creativity and play, and research courses. Her most recent area of research was Professional Development Schools. She also studied children’s creative and artistic development and school change. She received her Masters in Child Development from Iowa State University and her PhD in Curriculum and Instruction from the University of Maryland, College Park. Renee C. Falconer is a semi-retired Associate Professor of Education at George Mason University. She teaches child development and curriculum courses. She has taught children in countries all over the world (including United Kingdom, Canada, Australia, Kenya and the US) for 20 years and has taught teachers in the eastern, western and southern United States. She received her Masters in Early Childhood Education from the University of South Carolina and her PhD in Curriculum and Instruction/Early Childhood and Multicultural Education from Utah State University.